Chris Stack (Sidney Brustein) in The Sign in Sidney Brustein’s Window. Photo by Liz Lauren. The hypocrisy and folly of young liberal idealism seems to be a theme in two recent Chicago productions this season. 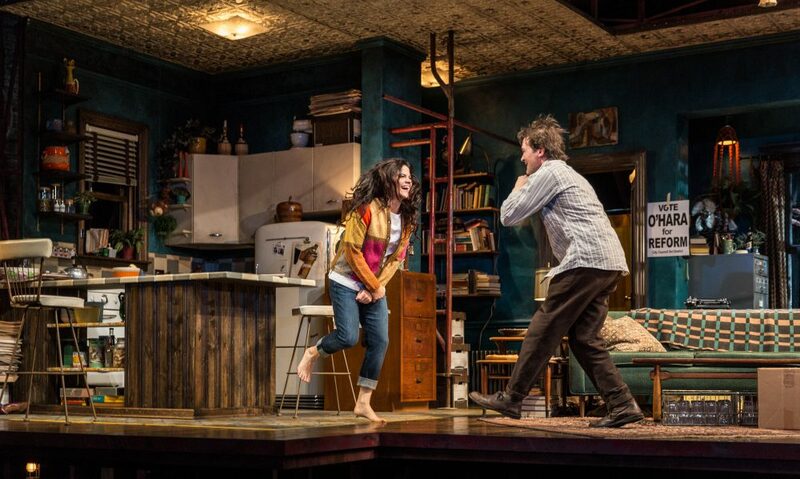 Sitting in the Goodman Theatre’s production of Lorraine Hansberry’s “The Sign in Sidney Brustein’s Window,” I couldn’t help but think of the Theater Wit’s recent production of “The New Sincerity,” especially in the first of its two acts. While the Wit’s production, which wrapped up last month, was focused on present-day millennials, Hansberry’s play is set in 1964. Both are set in New York, although Hansberry’s play really was a veiled look at the Daley Machine in Chicago. Both had similar sets, and similar male leads — sexist, ideological liberals who lose any sort of journalistic objectivity by backing political movements that turn out to a farce in both instances. Diane Davis (Iris) and Chris Stack (Sidney Brustein). Photo by Liz Lauren. Hansberry, who hailed from Chicago’s South Side Englewood neighborhood and whose most famous work “A Raisin in the Sun” has been a classic for decades, died of cancer in 1965 at the age of 34 as “Sign” was preparing to open on Broadway. While Hansberry’s masterpiece“Raisin” was about about a family moving to a faraway, racist city — a subject Hansberry knew first-hand, “Sign” is set in the world of white liberal intellectuals, a world she nailed down very well. There are several things going on in “Signs.” The main character, Sidney Brustein, (played magnificently by Chis Stack), is basically a dreamer. A failed owner of a defunct night club, he ends up buying a newspaper, which even in the world of 1964 is mocked by his wife as a dead-end idea. When Brustein isn’t drinking or putting down his waitress/aspiring actress wife Iris (Diane Davis in a fine performance); he’s going against his journalistic principals and backing political candidate Wally O’Hara (Guy Van Swearingen) who turns out to be a phony (even in 1964, this wasn’t an original concept). Add in Iris’ racist, anti-semitic sister Mavis, who is the strongest, most honest character in the play (played brilliantly by Miriam Silverman); a gay playwright neighbor David (Grant James Varjas) — a character that serves no real purpose; an artist Max (Phillip Edward Van Lear) who helps expose Brustein’s whimsical nature; a light-skinned African-American named Alton who passes for white when it suites him (Travis A. Knight) and who is in love with Iris’ other sister Gloria (Kristen Magee), until he learns she who is a high-end call girl and you have the world of Sidney Brustein. I applaud the writing of Hansberry. A lessor play definitely written in 1964 would not feel relevant and “Signs” feels in many ways like it is set in 2016. The main weakness however is not that it takes on too much, but that it gives almost equal time to three story lines — Sidney’s new venture; Sidney’s relationship with his wife; and Alton’s relationship with Iris’ sister Gloria. Perhaps if Hansberry wrote the play in 2016 or lived long enough to edit it, she would have cut down the first act, which no doubt caused the play to balloon to a lofty 2 hours and 50 minutes. Contrast that with “The New Sincerity,” which clocked in at 90 minutes and said just as much. Perhaps removing the character of David could have helped as well. The Sign in Sidney Brustein’s Window runs through June 5.